Last weekend at the Hand Plane Essentials class that I took from Port Townsend School of Woodworking, we covered sharpening extensively. they devoted half of the second day to the subject. Unfortunately for me they focused on waterstone sharpening to the exclusion of all other methods, except some on the topic of “sand paper on glass”. This was fine though, because Jim’s system of waterstone sharpening was fast and efficient. 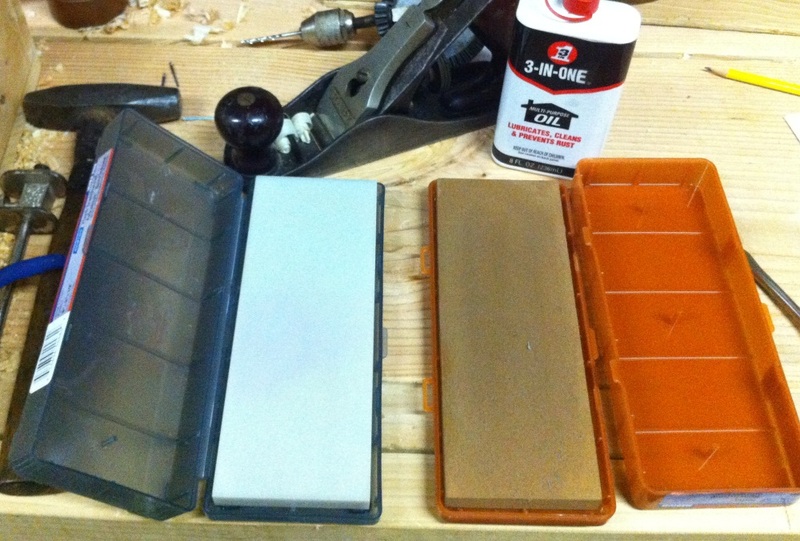 I was impressed, but I had previously decided to go Oilstone, and had purchased a number of stones already. Plus, on the advice of Mr. Schwarz I am going to commit to the Oilstones for a while, and see if I can make it work. If you skip around from system to system you’re essentially wasting time and money. I had purchased a set of India stones Coarse, Medium and Fine. I used some of my bonus money to purchase a high quality stone from Tools for Working Wood. They just recently started offering a 3″ wide Hard Translucent Arkansas stone in a 1/2″ size at a reason able price. I got the stone in the mail today, and it is a fantastic stone! I was blown away by the quality of this stone. I quickly ran down to the shop (with my three year old in tow, since we were hanging out today) to try it out. I set up the kid with a hammer and some nails and set him loose on some scrap lumber. I took a Stanley #3 plane I had picked up recently, and gave it a quick whirl using the same techniques that I’d learned at Port Townsend last weekend. With in a very short amount of time, I had a sharp blade and was taking shavings of decent quality. I wasn’t really trying for wispy thin shavings or anything, I just wanted to put a decent edge on it for testing out the new stones. I am very stoked to have finally gotten a sharpening system that I think will show results as I build my skills. My attempts on previous stones that I’d picked up were depressing, but now I know it has to do with the quality of the stones I was using. I’d gotten them at a tool show, with no idea of what I was buying. They’ll be good for knife sharpening I’m sure, but not for plane blades. They are too thin (2″ wide stones) for plane blades anyway. The system I learned at the class was really simple. It really was that simple. The #3 blade was dished in the middle, and it was pretty dull. In the class we used a grinder and the Lee Valley tool rest (which I have on order) to establish the bevel. On one of my blades we put an 8″ radius for a fore plane blade, but the other was straight across. At home I used the medium India stone to re-work the bevel. The coarseness of the India stone worked pretty well, and I went at it free hand for my first test run. I laid the blade down so the existing bevel was flat, and rocked back and forth keeping the bevel flat against the stone. Soon enough, probably 10-20 strokes the bevel was pretty good, although I think I need to spend a little more time on this blade. I wiped the oil from the stone, and moved to the Hard Translucent Arkansas stone. Adding oil to the stone, I found the bevel, and lifted my hands up an inch or so, and began to rock back and forth again for about 10 strokes. I got a decent micro bevel in that short time, and I hit the burr on the back side with the back flat on the stone, raised by a thin metal ruler (the ruler trick). Since this was just a test, I popped it into the plane, and ran a few passes over a board advancing the blade a little at a time. Right away I got some good shavings coming off the wood. Next time I go down, I’ll spend a little time setting the plane up, and sharpening some more to practice, but I was pleasantly surprised how quickly I got a decent edge from these two stones. I have some green stropping compound to add to a leather piece I am going to glue to a board for the final polish step. One thing I want to put into practice was something that I was discussing with Tim Lawson at the class in PT. He talked about honing (strop, or high grit stone) just before and right after you work with a blade will make it so that you will have to sharpen very infrequently because the blade never really gets dull. I’m not sure how that will work in practice, but it makes great sense for my carving tools. I want to set up a sharpening station in my shop, so I can just take the lids off the stones, hone, and go back to work. I’m not one of those guys who will be obsessing over sharpening, I just want to work the wood with sharp tools, and I think this system (with my new stone) will be just what I need. Glad to hear that you got some worth out of your class at PTSW. They are a good group there and I hope they continue to do well. That is good advice about sticking with one sharpening system instead of bouncing around trying them all. My method is different from yours, but it really doesn’t matter as there are many ways to do it. I use waterstones, grind a hollow bevel at my honing angle and use the stability of the hollow grind to help me hone the bevel. I hone up to 8000 grit and then work the bevel and flat on a flat board with diamond paste. It works well for me. By the way, there now seems to be a growing group of Pacific NW woodworking bloggers now. I have taken classes with both Marilyn of She Works Wood and Mike of The Inquisitive Woodworker. I am glad to see the increase in the people willing to share their woodworking experiences.